Destinations in Kuwait from Take A Break Holidays. 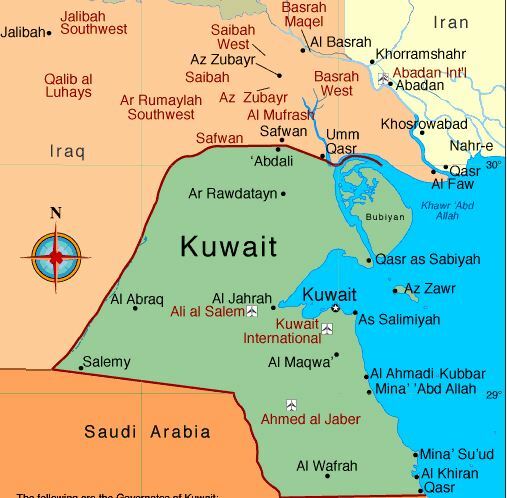 Kuwait is situated northeast of Saudi Arabia at the northern end of the Persian Gulf, south of Iraq. Kuwait is a constitutional monarchy, governed by the al-Sabah family. Fahaheel is located east of the Ahmadi area and is on the coast. The Fahaheel Fish Market is a major fish market in the City. Listing nearly 100 Accommodation places to stay at. Nearly 100 places of accommodation including apartments. It is situated northeast of Saudi Arabia at the northern end of the Persian Gulf, south of Iraq. It is slightly larger than Hawaii. The low-lying desert land is mainly sandy and barren. Kuwait is a constitutional monarchy, governed by the al-Sabah family. Kuwait is believed to have been part of an early civilization in the 3rd millennium B.C. and to have traded with Mesopotamian cities. Archeological and historical traces disappeared around the first millennium B.C. At the beginning of the 18th century, the ‘Anizah tribe of central Arabia founded Kuwait City, which became an autonomous sheikdom by 1756. ‘Abd Rahim of the al-Sabah became the first sheik, and his descendants continue to rule today. In the late 18th and early 19th centuries, the sheikdom belonged to the fringes of the Ottoman Empire. Kuwait obtained British protection in 1897 when the sheik feared that the Turks would expand their hold over the area. In 1961, Britain ended the protectorate, giving independence, but agreed to give military aid on request. Iraq immediately threatened to occupy the area, and the British sent troops to defend Kuwait. Soon afterward, the Arab League sent in troops, replacing the British. Iraq’s claim was dropped when the Arab League recognized Kuwait’s independence on July 20, 1961. Historically, Kuwait followed a neutral and mediatory policy among Arab states. Food plays and important role in the Kuwaiti culture. There is no such thing as Kuwaiti restaurant anywhere in the world—Kuwaiti food can only be eaten at Kuwaiti homes. the most popular dish is the “Machboos”, which is chicken, beef or fish over a specially spiced rice. Lunch is the main meal in Kuwait, and it is extremely important for families to feast together—It is like Thanksgiving everyday. Kuwaiti tea is usually served after lunch. Kuwaiti tea is just regular hot tea, but many families add some flavors to it such as saffron or mint. Arabic coffee is also very important especially when Kuwaitis have visitors. Traditionally, when people visit, the first thing served should be the Arabic coffee. Food plays an important role in the Kuwaiti culture. Kuwaitis usually have lunch at home, but dinner is most often eaten outside. There is variety of restaurants and cuisines to choose from. Everywhere you go there are small sandwich restaurants selling sandwiches like falafels and shawarmas (shredded beef or chicken). These restaurants are usually called Arab or Kuwaiti fast foods. They are not as unhealthy as American fast food, but they are surely cheap and tasty. Tutorial on how to cook chicken Machboos, the national dish of Kuwait. Local Cuisine. Kuwait City: Including its History, Abdullah Al Salem, Al Andalus, Bayan, Bneid Al-Qar, and More. Discover Kuwait City and like never before. Whether you are a first time traveler or avid visitor of this region of the world, this book is the perfect guide for you. Read about all the amazing surprises you could find while strolling in the city and all the must see places. Included in this book are the National Museum, the Grand Mosque, the Sadu House, and everything in between. With content from a huge community of contributors, you get the convenience and security of a real print travel guide, but with fresh data and content. Earth Eyes Destinations represents a new publishing paradigm, allowing disparate content sources to be curated into cohesive, relevant, and informative books. To date, this content has been curated from Wikipedia articles and images under Creative Commons licensing, although as we increase in scope and dimension, more licensed and public domain content is being added. We believe books such as this represent a new and exciting lexicon in the sharing of human knowledge. Some of the photo’s I took while there 22nd October-9th November. Places include Salmiya, Marina Waves, Kuwait City, Kuwait Towers, 360 Mall & The Scientific Centre. Hope you Enjoy! Take A Break Holidays takeabreakholidays, kuwait Accommodation.